U.S. Wheat Associates (USW) is supported by a highly successful partnership between our state wheat commission members and cost-share funding from the USDA’s Foreign Agricultural Service (FAS) through the Market Access Program (MAP), the Foreign Market Development (FMD) program and other programs. How does U.S. 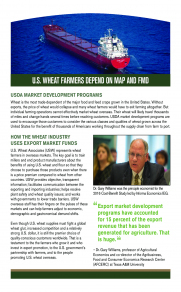 Wheat Associates work with USDA to promote U.S. wheat exports? U.S. 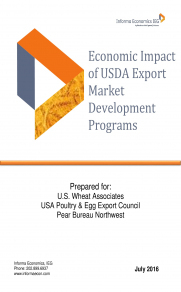 Wheat Associates (USW) applies every year for USDA funds to support its export market development mission. 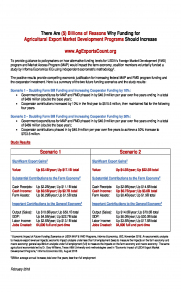 This is an extensive strategic planning process that carefully examines every market, identifying opportunities for export growth and recognizing trends or policies that could threaten existing or prospective markets. In turn, the depth of this process is only possible because of the USDA funds that allow U.S. wheat farmers to have on-the-ground representation in these markets. In addition to supplying funds, USDA acts as a strategic partner through its extensive network of foreign service officers and civil service support in the United States. The foreign service officers provide vital liaison with government officials and are active in market development work. The civil service likewise plays a critical role in everything from supporting the foreign service, managing the relationships between organizations like USW and USDA, providing market information, analyzing trade policy barriers, and much more. Do farmers know what their overseas buyers want? U.S. Wheat Associates helps provide a feedback loop for overseas customers directly to U.S. farmers and quality researchers. This leads to improved varieties and helps farmers manage their crops with the end user in mind, which would otherwise be thousands of miles and multiple steps apart in the supply chain. MAP and FMD funds make it possible for wheat farmers to have representatives who can work directly with their customers on a daily basis and translate customer needs directly back to the state wheat organizations, who are in turn helping direct research for wheat crop development in their states. Are there any examples of U.S. Wheat Associates’ work increasing exports to specific markets? Learn more about specific market development success stories on wheat and other commodities here. How do wheat farmers contribute to market development? Wheat producers contribute a portion of their wheat sales (either by volume or by production value) to their state wheat commission, called a checkoff. State wheat commissions in 17 states contribute a portion of their checkoff dollars to USW. On average, U.S. wheat farmers contribute about one third of a penny per bushel ($0.032)to USW. USW does not receive direct funding from any commercial source. 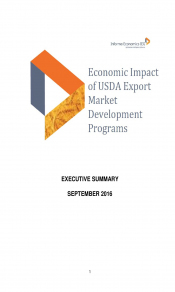 How does the U.S. government contribute to market development? 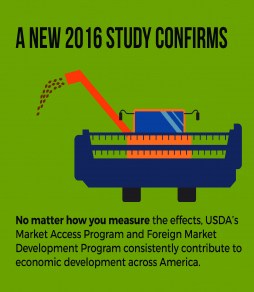 USDA/FAS matches checkoff dollars with export market development funding through two programs: the Market Access Program (MAP) and the Foreign Market Development (FMD) program. While the specific contribution varies each year, USDA/FAS has matched about $2.00 for every $1 in farmer funding. Benefits to the entire wheat supply chain from farmers to the longshoremen who load wheat on vessels for export. 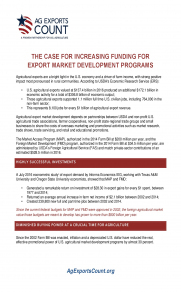 What kind of return on investment do farmers and taxpayers get from their support? Provided a remarkable return on investment of $24 in export gains for every additional $1 spent on foreign market development (the ratio is $28 to $1 between 1977 and 2014); this is consistent with results from several previous studies. 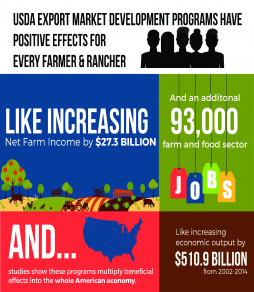 Increased average annual farm income dramatically by $2.1 billion. 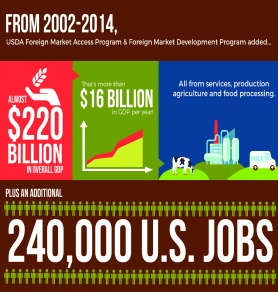 Created 239,000 new full and part-time U.S. jobs; 93,000 of these jobs were in the agricultural and rural sectors. These results are consistent with the conclusions of a January 2016 economic analysis of wheat export promotion showing U.S. wheat farmers received $45 in net revenue for every $1 they invested in export promotion between 2007 and 2014. The study also showed that every $1 invested by U.S. wheat farmers and the government returned about $149 in gross revenue to the U.S. economy during that time. Visit www.AgExportsCount.org for more information.